Malory: Most secret agents dont tell every harlot from here to Hanoi that they ARE secret agents! Archer: Then why be one? The show follows titular protagonist Sterling Archer, an agent for the open-market spy agency, the International Secret Intelligence Service (ISIS; not to be confused with a certain real life Islamist militia), and his random misadventures both inside and outside of the office walls. Archer makes for a well-trained spy—but his Jerkass behavior and his tendency to remain oblivious to everything except himself often renders his competence in the field next-to-useless. Archer's humor, much like Arrested Development (and spiritual predecessor Frisky Dingo), relies heavily on Call Backs and Running Gags and, like that show, has a large Ensemble Cast (including a cast member or two from Arrested Development) and Two Lines, No Waiting plots. 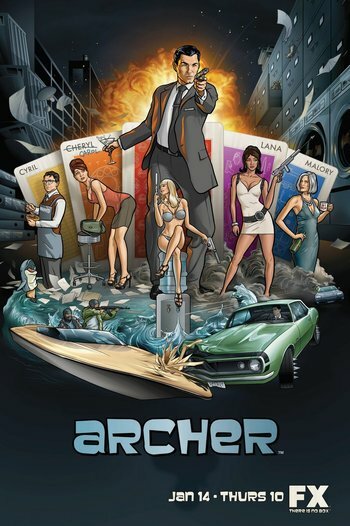 A fan of either Arrested Development or Frisky Dingo will almost certainly enjoy Archer, whereas someone who found either show repetitive or too low-key probably won't. With Season 5, the show took a departure from its usual approach as a way to prevent Seasonal Rot and started the theme of titled seasons; In the first episode of Archer Vice, the FBI closes down ISIS, pointing out that the agency was never actually legally sanctioned in the first place. As spies with no other job skills, the staff remain in Malory's employ to further help her "dispose" of the leftover evidence in her concealed vault: a literal, not figurative, metric tonne of ISIS-confiscated cocaine, worth about fifty million dollars, literally changing the entire premise of the show from a spy agency to a drug cartel. The Vice story finished in the season finale, with ISIS, no longer using that name because of the real life terrorist group, heading into Season 6 with a new direction: being subcontracted by the CIA. After a string of failures, they are permanently blacklisted from espionage. Season 7, Archer, P.I., had the cast move to Los Angeles and start a Private Detective agency. Season 8, Archer Dreamland, is a Film Noir coma dream with a Retraux Roaring Twenties jazz opening. Season 9, Archer Danger Island, continues the coma theme but goes from noir to Two-Fisted Tales: a tiny pacific island shortly before the outbreak of World War 2 with a new "jungle adventure" themed opening. Adam Reed has stated that he plans for the upcoming tenth season — Archer 1999 — to conclude the series. This series has a character sheet, a Shout-Out page, a page listing tropes found on the characters' Twitter feeds, a page of episode summaries (which Needs Wiki Magic Love), and even a page examining the show's time period. You can vote for best episodes here . Don't confuse this show with the BBC radio soap The Archers or the many other fictional characters who share Sterling's surname. It also has nothing to do with the Archer Archetype (that's about those guys with the bows and arrows). On June 21, 2016, it was announced that the show had been renewed for three additional seasons and that the 10th season will almost certainly be the show's last. How Can Santa Deliver All Those Toys?